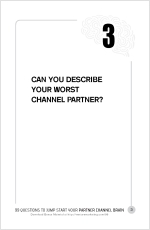 Home → Uncategorized → Can you describe your worst Channel Partner? After reading my post on Question 2, you might conclude Intel had a love affair with its distributors, and that may have been the case at the HQ offices for both parties, but in the field it was a different situation. I remember walking into one of my first meetings in our Chicago regional office where I was assigned after my first round of training in our West Coast offices. I entered our smoke-filled conference room (Marlboro’s were the favorite) and quickly learned the meeting was about some screw-up at one of our local distributor sales offices. More than likely, a disti rep (shorthand for distributor sales representative) switched the business from Intel to Motorola. The guys in my office hated Motorola. When they said, “Motorola,” it sounded evil. Like it came out of the mouth of The Exorcist’s Linda Blair. Whatever happened, it was bad. And these guys had to vent. I really had no idea it was possible to string so many expletives into one sentence that actually made sense. It was after this meeting a $1 fine was instituted by my Regional Manager, Frank Gill, for every negative thing uttered (or gestured) about a distributor. Of course that didn’t do anything to stop the complaining. But it did put money into distributor party budget, which was only fitting I suppose. Over the years I learned a lot about Channel Partners, especially what happens at the local level, in the field, where most of the problems come to a slow boil. You see, the top-brass can shake hands and do all sorts of backslapping when a contract is signed. That’s the easy part. You just better hope it works at the street-level. That’s why it is also a terrific idea to know the telltale signs of your worst performing distributors, so can spot one before you bring them aboard. And if you do have a few active distributors that are a bad fit, understanding the early warning signs may keep you out of danger in the future with other Partners. Like good employees, your top performing Partners are a good fit for your organization at a human level. I call it my “chemistry test.” Is the chemistry between local field reps and my reps a good one? Often, those Channel Partners described as “poor performers” or “worst channel partners” are a top performer for a another company on the line card. It’s rare a given Channel Partner is a poor performer for all their lines, otherwise they’d be out of business. That’s why I’m careful to get a lot of local input before any contracts are signed. Two things that are not on my list: Reliable forecasts and ability and desire to lead with my product. Forecasting is difficult enough for my direct reps. Yes, my best Channel Partners are able to forecast, but that’s because they have established deal-flow. I’m not going to fire a Channel Partner only because of forecasting inaccuracies. The second forgivable sin, not leading with my product, is something I take full responsibility for (at least up front). If I cannot come up with a way to incentivize, motivate, encourage and train a Channel Partner to have the desire and ability to lead with my product, the fault is mine, isn’t it? Naturally, my list is not your list. You should have a list, especially for the reasons I’ve outlined. At the very least it’s a good way to keep your team from complaining about things that are essentially their responsibility to correct. Interesting points. At the end of the day, all non-performance issues lie on your own doorstep (your caveat seems to reflect this). Either they started at the point of poor partner selection and vetting ahead of signing them up or the Channel partner/s are not being managed correctly. Sins that I have seen include inconsistency from the Principal i.e. changing the rules on the channel partner too often and/or with poor communication and channel partners who drive their business by competing purely on price against other partners in your channel (I believe this could be prevented by a sound channel strategy and clearly defined rules of engagement). Not sure what you mean by financial shenanigans. if it means that there are unethical ‘backhanders’ etc. they definitely will kill your chances of success in the long haul. I have found that channels built on opportunism will eventually break down. A clear understanding and articulation of your own internal goals and objectives and their marriage to a long term channel strategy usually makes a good start. Obviously, we don’t often get the chance to start a channel from scratch so we have to work within the channel that exists already. That being said, one can still gradually work towards your goal through performance expectations. Problems with a channel partner will soon start to show up in the numbers. Weeding out poor, ‘bad-fit’ partners can then be done based on results and sound metrics without negatively impacting your channel. There is so much to be said about this topic the most of which has already been documented in books and journals so I will cut it at this time. Hi Dave, you are so right about “…[not getting] the chance to start a channel from scratch so we have to work within the channel that exists already” as well as your point about channels built on opportunism eventually breaking down. Let’s face it, if a company could afford their own sales force, they wouldn’t have to rent one. And consequently, a lot of folks see their Channel Partners as mercenaries and are shocked when they learn they are not. That’s what happens when opportunism (as you pointed out) prevails. The financial shenanigans I was referring to are things like Channel Stuffing, as I’ve defined in my B2B Marketing Glossary.